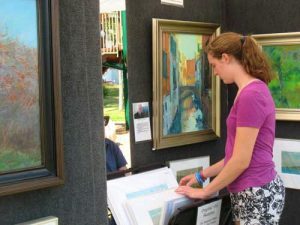 The Rangeley Friends of the Arts’ 39th annual “Art in August” will be held in the heart of Oquossoc Village. Always the first Thursday in August, the show will take place on August 1st from 10 AM to 4 PM. Artists’ exhibits will be in the Oquossoc Park. Come see this year’s offerings as the tradition of presenting fine art and fine craft continues in the Rangeley Lakes Region. Oquossoc Village is a location sure to please visitors and patrons of fine art and fine craft. All amenities are within easy walking distance of the artists’ displays and there is ample parking. Local restaurants and grocers will happily accommodate your desire for lunch or refreshments so you can visit each exhibitor and make selections at your leisure. Prizes will be awarded in both fine art and fine craft categories. Ribbons will be awarded early so that throughout the day, the public can enjoy viewing the winning pieces. Click the button below to submit your Application Fee online.